4 events for 4 seasons! 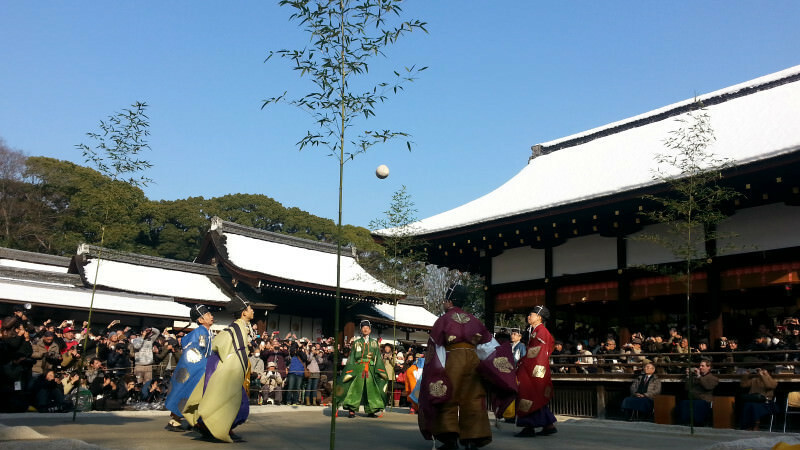 There are 4 seasons in Japan, and here are the 4 best events for each season in Kyoto! 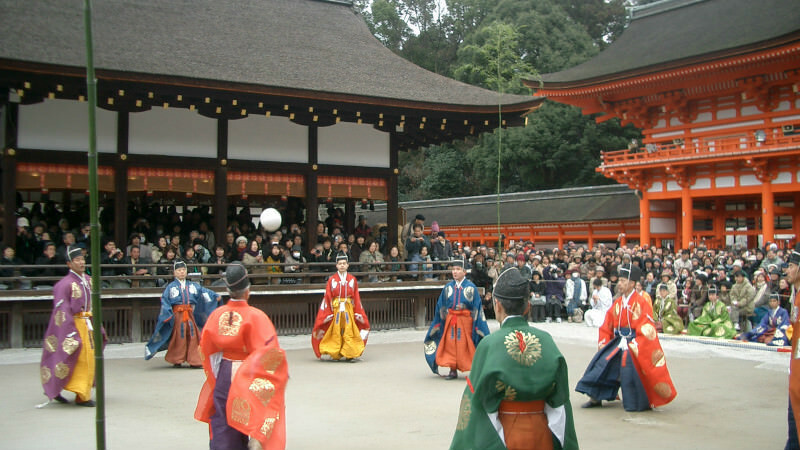 In Kyoto that is, of course, famous for its many sightseeing spots like temples and shrines , there are great events that take place every season of the year. In this article, you will find my recommendation for the best event for each of the four seasons. I hope this article will be useful when choosing the time of year and event you want to go to in Kyoto! Spring in Kyoto means cherry blossoms. By the time the cherry blossoms start to bloom there are many events in Kyoto where you can enjoy the blossoms. Many people who visit Kyoto in spring come here because they want to see the cherry blossoms. I want to especially recommend the Jikkokubune boat ride you can take in Okazaki. 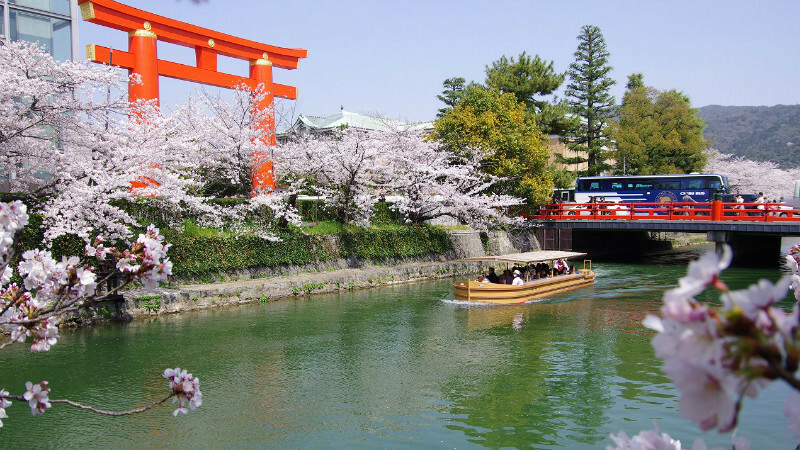 This event offers you a luxurious chance to see cherry blossoms from a boat. This event is recommended for those who want to experience the cherry blossoms in a more special way! 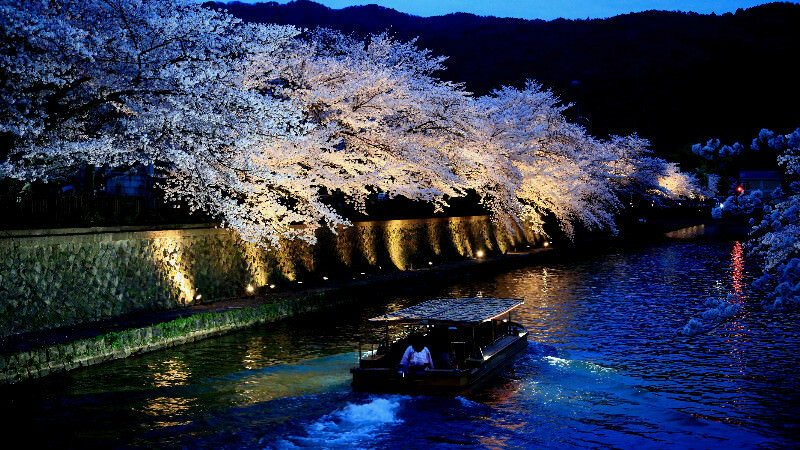 At night the cherry blossoms are illuminated and you can experience the cherry blossoms in a new, mysterious light. The number of people that can ride on the boat at one time is limited so you can enjoy the cherry blossoms without having to worry about the crowds. I’m sure this will become a cherry blossom memory you will never forget. Event dates：From the end of March to the beginning of May (The cherry blossom illumination is from the end of March to the beginning of April). Summer festivals are the most famous of the events that take place in summer. There are many summer festivals that take place in Kyoto, but among them I would like to recommend the Mitarashi Festival at Shimogamo Shrine. 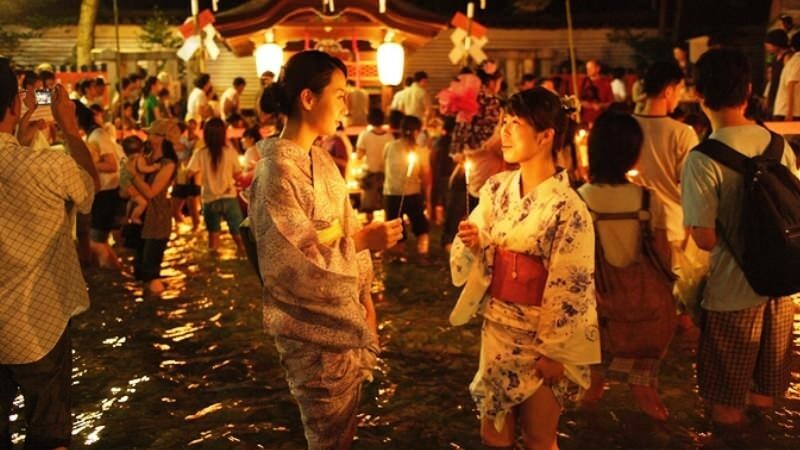 You can walk in the river that runs through the shrine while holding a candle in your hand, and by doing this you are participating in a ritual praying for good health for the following year. Even though this is a Shinto ritual, it is not a solemn one, and anyone can take part in this fun festival. After walking carefully with the candle so that the fire doesn’t go out, you will place it on an altar. The sight of the flickering flames of the candles in the twilight is fantastic! If you want to feel even more summery, how about taking part wearing a yukata? Event dates: End of July. My recommendation for autumn is Kangetsu no Yube. The harvest moon in autumn is especially beautiful on one day, and on that day there are many “tsukimi” moon viewing events. The Kangetsu no Yube event at Daikaku-ji Temple in Arashiyama is a chance to see two moons: one in the sky and one on the surface of the clear pond of the temple. 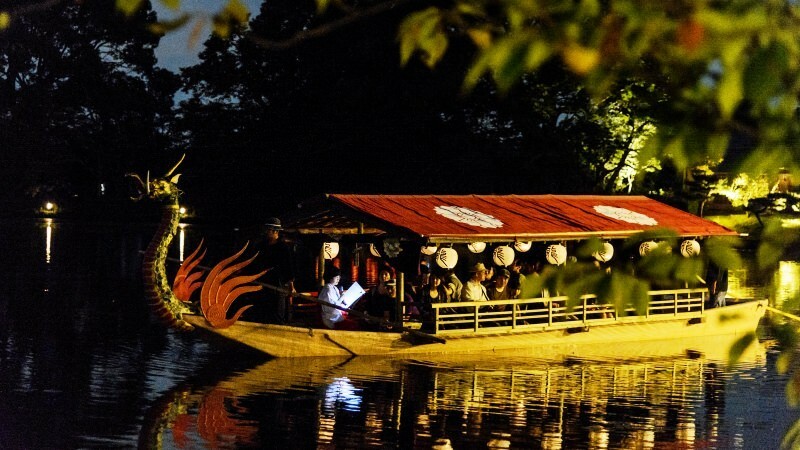 During Kangetsu no Yube you can buy a ticket to take a boat ride on the pond. 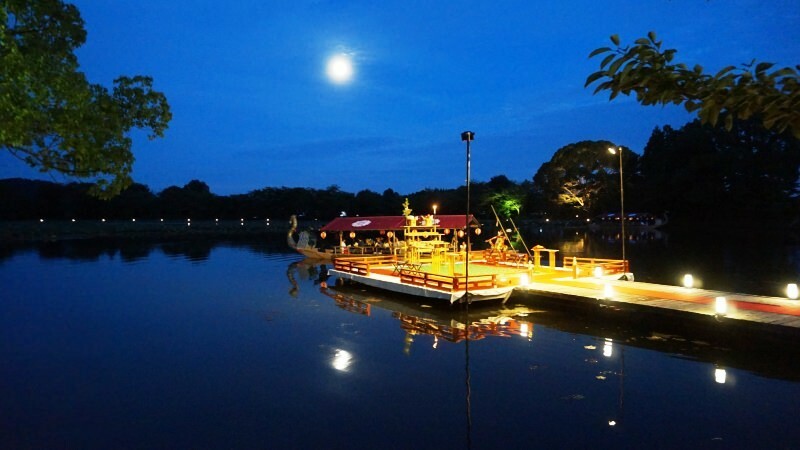 It is a good idea to take an elegant boat ride on the pond, but it is also a good idea to look at the moon from the shore. This event is a popular autumn event, and many people come from overseas to take part in it. In Kyoto there are many shrines and temples, and in January at many of them there are events and rituals praying for a safe year, and these events are also popular among tourists. In the Kemari Hajime event you have a chance to see people wearing period clothing play the game kemari that was popular in the Heian period. Kemari is a game bit akin to soccer, but you lose if the “mari” ball drops to the ground so the game requires a high level of skill. 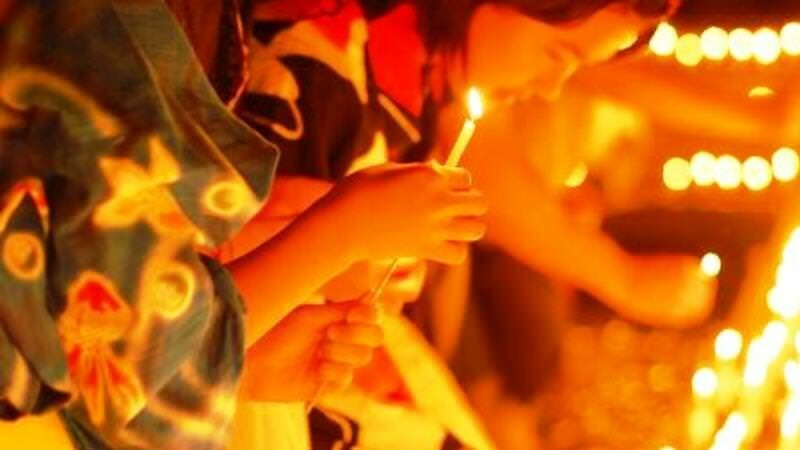 Illumination events are also fun, but since you are in Kyoto, how about participating in an event where you can feel the history of the ancient capital? Event date: Every year on January 4. These were the four events for four seasons, all in Kyoto where the transitions between seasons are thought to be very important. I hope you will enjoy the season you decided to visit Kyoto in by going to a seasonal festival and enjoying the four seasons of Japan in the ancient capital.